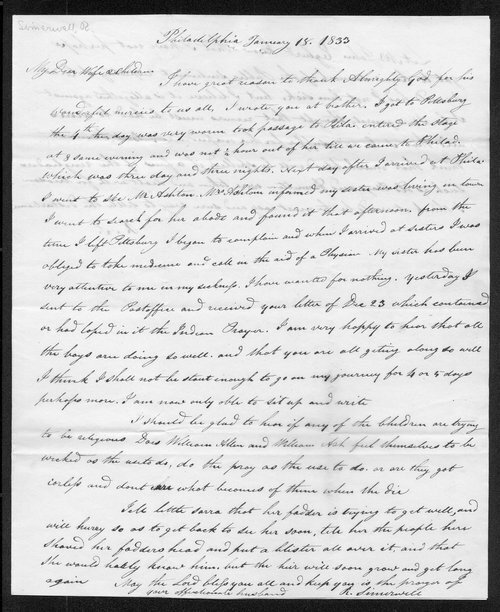 In this letter to his wife and children, Robert Simerwell responds to a letter he recently received from them while he was visiting Philiadelphia. He also addresses events related to the Nullification Crisis that was the focus of the nation. Clear in his opinions on the matter, Simerwell states that public sentiment is largely against South Carolina. In fact, Simerwell states that "it is generally thought that recours must be had to arms and that S.C. will suffer for her independence." However, Simerwell does not think that "much blood will be spilled if a few of the ringleaders?were taken and dealt with for treason."